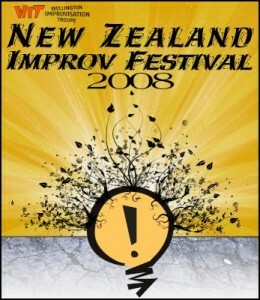 The first New Zealand Improv Festival 2008 ran 27-29 November at BATS Theatre, and featured performances from Wellington, Auckland, and Christchurch troupes. New Zealand’s most playful minds spring forth from Christchurch, Wellington and Auckland – together at last to present an action packed, hilarious symphony of improvised theatre – for three nights only! For the first time the country’s top improvisation companies come together to expose Wellington to a plethora of improvised comedy at its funniest and most daring.Each night two different companies take to the stage to entertain. In the grand finale on Saturday – the teams join forces, mix and fight it out in a ‘Festival All-Stars’ extravaganza – showcasing the best players from around the country. Join us at BATS Theatre for a blooming great festival of moment-to-moment hilarity, a festival of spontaneous thought, high wire danger – The New Zealand Improv Festival! 29 Nov: All Stars Improv Spectacular! What is Improvisation? Improv brings ordinary people into the theatre to enjoy stories spontaneously created from audience suggestions. For the players, improvisation provides a platform to explore performance and the narrative form. Most of all, it’s fun for everyone involved. Popularised by television shows like ‘Who’s Line Is It Anyway?’, improvisational theatre continues to evolve and entertain. This entry was posted in Other formats, past shows and tagged improv, improv festival, nzif on November 1, 2008 by MaDmin.